At My Body & Spirit, we offer a range of quality overseas dental treatment and holiday combinations that are not only affordable but also professional, safe and of an international standard. We have hundreds of extremely happy overseas dental treatment My Body & Spirit travellers as well as 35+ years experience in the tourism industry. A dental bridge is an artificial tooth which is fused between two porcelain crowns to fill in the area left by a missing tooth. This method is very common for replacing one or more missing teeth. Bridges are permanently fixed in your mouth making them non-slip and non-removable. Having a crown or bridge fitted is very reliable in solving severe dental problems to permanently restore the missing tooth or teeth’s functional and aesthetic appearance. For this process, porcelain is used to closely blend crowns and bridges in with the surrounding natural teeth. If you are missing any teeth and want to maintain good oral hygiene practices, a bridge may be suitable. A bridge is the most common choice to fill the space in your mouth left by missing teeth. Your dentist can offer a quality overseas dental treatment consisting of 3, 4 or 5 unit bridge depending on how many teeth are missing. Open tooth spaces can cause the surrounding teeth to grow out of position and can cause teeth and gums to become more susceptible to tooth decay and gum disease. Fixed dental bridges correct an altered bite, improve your chewing ability and speech. It also protects your appearance by preventing the collapse of your facial features that can cause premature wrinkles and age lines. A dental crown will restore an existing tooth to its normal shape and size, strengthening and improving the appearance of a tooth. Crowns are use when a tooth is broken or damaged and fillings won’t solve the problem. If a tooth is cracked, a crown holds the tooth together to seal the cracks so the damage doesn’t get worse. Crowns are also used to support a large filling when there isn’t enough of the tooth remaining, to protect weak teeth from fracturing, restore fractured teeth, or cover badly shaped or discoloured teeth. Crowns are used to attach a bridge, so they are a common way to restore teeth. To prepare the tooth for a crown, it is reduced so the crown can fit over it. An impression of the teeth and gums are made and sent off to the lab for the crown fabrication. A temporary crown is fitted over the tooth until the permanent crown is made. On the next visit, the dentist removes the temporary crown and cements the permanent crown onto the tooth. The dentist’s goal is to make the crowns look like natural teeth. Your tooth colour, bite, shape and length of your natural teeth can affect your appearance. Dental crowns require greater removal of the tooth, so a crown will cover over your tooth more than a veneer. Veneers are used for teeth that need a new cover but are not severely damaged. Porcelain veneers are a thin shell of ceramic material, which is bonded to the front of teeth. This quality overseas dental treatment requires little or no anaesthesia, and can be the ideal choice for improving the appearance of the front teeth. Porcelain veneers are used to hide discolouration, to brighten teeth, and to improve a smile. They are very resistant to permanent staining from coffee, tea, and red wine. When should you have a veneer? Porcelain veneers are an excellent alternative to crowns in many situations. They provide a much more conservative approach to changing a tooth’s colour, size, or shape. Porcelain veneers can hide defects, such as teeth stained by an injury, or as the result of a root-canal procedure, and are ideal for covering discoloured fillings in front teeth. Situations in which the front teeth are mildly crooked, or rotated can be corrected with porcelain veneers. Sometimes old crowns or bridges can be resurfaced with a porcelain veneer to repair or add new life to an old restoration. A veneer is a popular treatment for filling gaps between your teeth. For about a week or two after you have veneers fitted, you will go through a period of adjustment as you get used to your “new” teeth and bite. Brush and floss daily. My Body & Spirit’s quality overseas dental treatment for dental implants provides access to affordable and leading technology used for replacing missing teeth with a most natural look. The dental implant is a titanium screw that is surgically placed in the jaw. This implant eventually fuses with the bone around the jaw about two to six months after surgery. These implants can then be used to anchor crowns, bridges and dentures. The dental implant goes into the jaw exactly like a natural tooth root. Dental crowns can be made to cover the implant post. Many people who have implants for a comfortable and cosmetic fit use porcelain fused to gold crowns. This is the “high tech” solution and the most natural replacement to replace the lost tooth/teeth without harming the remaining teeth and soft tissue. 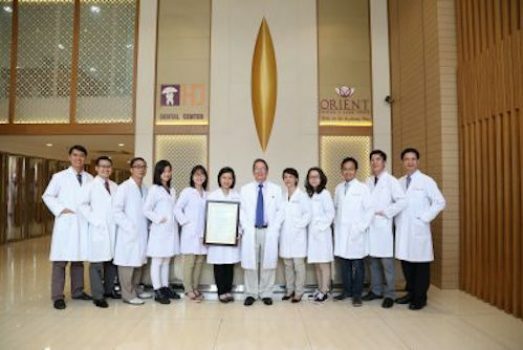 Patients can receive several benefits from undertaking this quality overseas dental treatment. Ideal results include restoration of normal appearance of the missing tooth/teeth. Patients can achieve considerable confidence during eating and talking. Also patients can enjoy the long term safety of replacing their lost teeth with dental implant. Dental implant is not suitable for everyone. 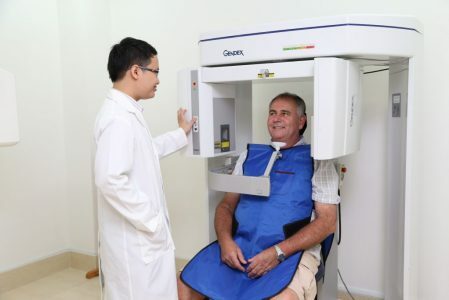 Patients are evaluated at a consultation appointment with respect to their jaw size, bone volume, quality and quantity of bone, also the condition of the opposing dentition. The anatomy of the front of the lower jaw is studied by using x-rays taken at varying angles. This evaluation is to ensure suitability for the tooth implant as the components for the treatment are all precision made prefabricated components. Therefore the size and shape of the jaw must comply with established criteria.